Visible imagery from NASA's Aqua satellite revealed the center of Tropical Cyclone Idai in the Mozambique Channel. The Mozambique Channel is the body of water in the Southern Indian Ocean that flows between Mozambique on the African mainland and the island nation of Madagascar. Tropical Cyclone Idai developed on March 9 around 4 a.m. EST (0900 UTC). It developed from the low pressure area designated System 98S. When it strengthened into a depression, it was renamed Tropical Cyclone 18S. After strengthening into a tropical storm on March 10, it was renamed Idai. 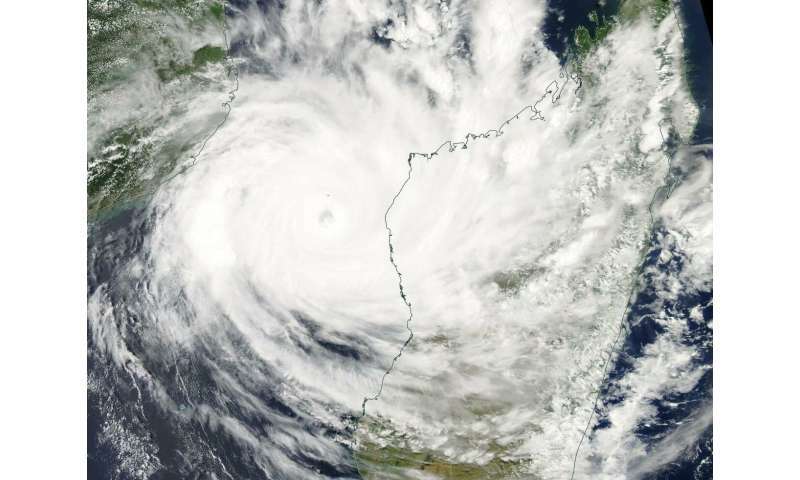 On March 11, 2019, the Moderate Resolution Imaging Spectroradiometer or MODIS instrument aboard NASA's Aqua satellite captured a visible image of Tropical Cyclone Idai. Bands of powerful thunderstorms were wrapping around an eye obscured by high clouds. The eye appears to be about 17 nautical-miles wide. At the time of the image, west-central Mozambique was being affected by the eastern quadrant of this powerful storm. On Monday, March 11, 2019 at 11 a.m. EDT (1500 UTC), Idai was located near 17.6 degrees south latitude and 42.6 degrees east longitude. That's about 307 miles north-northeast of Europa Island. Idai was moving to the southwest and had maximum sustained winds 105 knots (121 mph/194.5 kph). It was generating maximum wave heights near 27 feet (8.2 meters). The Joint Typhoon Warning Center expects Idai to intensify further as it moves west. Idai's sustained winds are expected to peak at a Category 4 hurricane strength (on the Saffir-Simpson hurricane wind scale) with 125 knots (144 mph/231.5 kph) before making landfall near Beira, Mozambique after March 15.